What is more adorable than 7 girls in matching dresses? Matching Dresses for Teens and Adults as well! 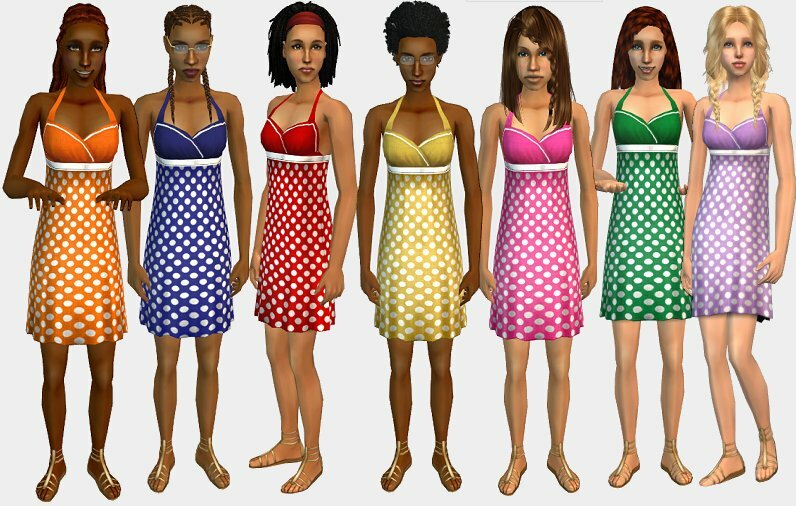 The 7 girls use the first 7 face templates in CAS. The skins are the 4 EA skin colours, plus 3 more of the tween skin colours that strawberry did. Hair by Almighty Hat. I think they look very lovely - and considering that they're using standard face templates, I think it says a lot for the custom makeup we have now. N99 for the August Goodies week these were made for, and Pru and Dee for thinking of it in the first place. Fanseelamb for making me notice the mesh. Great upload kiri - the pictures are also really nice and easy to see. That's because I took one look at how Fakepeeps7 did her clothing shots and decided that was the way to go. I love her shots and they are so easy to see what you are getting.